This two-piece short homecoming dress with a tiered tulle skirt and an embroidered top is as cute as they come. 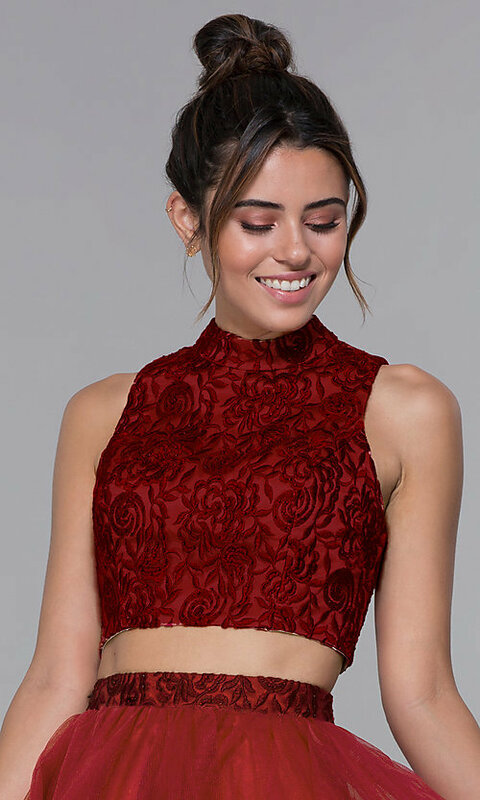 The high-neck satin crop top on the sleeveless two-piece party dress draws the eye with a beautifully embroidered rhinestone-accented floral pattern. Cut-in shoulders and a teardrop back cut out add to the appeal. Matching embroidery, dotted with sparkling stones, highlights the waistband of the tiered satin-lined tulle skirt. Shape-keeping horsehair hems complete the whimsical look of this adorable two-piece homecoming dress. Well under $200, this embroidered-top short hoco dress is ideal for school dances and other semi-formal events.